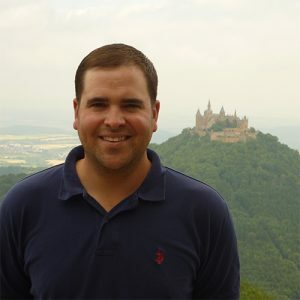 Jim has been guiding in Berlin, Potsdam and Dresden for just over a decade since arriving in Berlin from the University of Minnesota in 2005 to complete his studies in German History and to use the research facilities at the Humboldt University and Free University of Berlin. Over the years, he’s worked as a full-time guide for several reputable companies in Berlin doing a combination of public and private walking tours, as well as bus tours for large tour groups. He’s a licensed guide at the Cecilienhof Palace in Potsdam where President Truman, Stalin, and Churchill (and Attlee) attended the Potsdam Conference just after WWII in 1945, and he’s also written tour descriptions for North American tour agencies that lead tours to Potsdam and Berlin as part of their European educational excursions. Jim is a founding member of the Berlin Guides Association (Bündnis Berliner Stadtführer – BBS) and serves on its Board of Directors as the Outreach Coordinator, which strengthens and establishes new partnerships with museums and institutions in and around Berlin. His deep knowledge and easy going Midwest manner make all of his tours an enjoyable experience.